There is something terribly romantic about Tullamaine Castle in Fethard, Co. Tipperary, as it lies in the sleepy ‘Gallant Tipps’ country. Autumn is the most special time of year when the hunt gets into full swing for another season and when Tullamaine plays host to an opening meet, the castle seems to emerge from the trees as each leaf falls onto the majestic manicured avenue. One can imagine that this is what attracted Pam and Derek Jackson to Tullamaine, with the large estate to indulge Derek’s passion for hunting and Pamela’s love for all things rural. Another fact which might have swayed their decision to relocate was that Ireland didn’t have the post-war tax issues that Britain imposed on the landed gentry to pay for WWII. 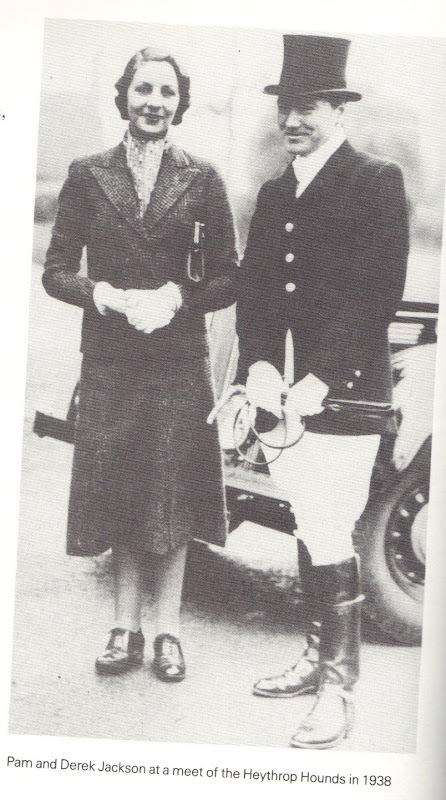 Initially, Pam and Derek loved their time at Tullamaine, with Pam’s sister Debo, the Duchess of Devonshire, chatelaine of Lismore Castle in Co. Waterford, taking residence every April for the fishing on the Blackwater River. Alongside Debo, their guests ranged from Nancy Mitford, Evelyn Waugh, Patrick Leigh Fermor and ‘Uncle’ Harold Macmillan. Around the same time, Pam’s other sister Diana, the infamous Lady Mosley, came to Ireland having bought Clonfert Palace in Galway. After Clonfert burnt down, Diana and her husband, Sir Oswald Mosley, bought a beautiful Georgian property, Ilecash House in Fermoy, which is only a short drive to Lismore. The early years at Tullamaine were a wonderful time for Pamela. Here she could be completely at home in her surroundings with her beloved dogs, horses and vegetable garden. It was in this renowned garden that Goldie Newport recalled in The Mitford Girls’ Guide to Life to seeing for the first time ‘purple sprouting broccoli’. Amongst the hunting fraternity, Pam and Derek’s friends would include: Sivver Masters MFH (Debo remembered her great dinner stories at Tullamaine over two or three large brandies), the Earl and Countess Donoughmore, Bourkes and Ponsonbys, as well as the local community of Fethard. Derek Jackson, an amateur jockey, loved all things equine but it was his passion for science and the lure of the lab at Oxford which drew him further and further from Tullamaine Castle, Pam, and, eventually, Ireland. In 1950, Pam and Derek decided to separate and sell the castle. As a testament to her love for Tullamaine, Pam was persuaded to stay on as a tenant for another eight years but not before having the new landlord install electric lighting. An example of her shrewd and somewhat loveable, but naughty, behaviour – typical of a Mitford girl – Pam told her new landlord she ‘had no milk for the workmen’s tea’, and as they had re-wired the house, she must ‘have a cow for them’. The landlord duly obliged and sent ‘a marvellous four gal. cow in a lorry from cork (70 miles). Of course, the men only used a pint a day’, so Pam bought four piglets which she ‘brought up on the milk’ and the rest she sent to the creamery and received a cheque for £10. Miss Giuditta Tommasi was a frequent visitor to Tullamaine during Derek’s time there and after he departed. As an ardent equine lover she, too, rode out with the Tipps’ and is fondly remembered for bursting into Newport’s shop looking for a pig’s face. In her broken English she had meant to ask for a pig’s head. I, having met Pam as a young boy, now regret that she did not decide to live her life in Ireland but instead moved to Switzerland and eventually to Gloucestershire, the country of her early childhood. But the memories of this twinkling old lady with sky blue eyes and snow white hair will forever live with me. I also remember she had a voice so soft that it would melt a glacier and she had aroma of fresh air with a hint of lavender. I can only assume this loveliness was a combination of the fresh outdoors which she enjoyed, her kindness toward animals, and her love for the countryside.